Published: July 5, 2013 at 09:14 p.m. Updated: July 7, 2013 at 03:03 p.m.
Colin Kaepernick created a buzz in social media circles when a photo surfaced of the quarterback donning a Miami Dolphins hat at a Fourth of July party. Kaepernick owns more than 400 pairs of shoes as well as an impressive collection of baseball caps from numerous sports teams. The Dolphins hat was just another fashion statement from a man who obviously loves to accessorize. Some San Francisco 49ers fans didn't see it that way, though. Kaepernick was given the Keenan Allen treatment in social media circles, leading to a Friday retort. "This the hat y'all mad at? I'm goin wear what I want regardless of what you think," Kaepernick said, via Instagram. "All you need to worry about is the fact that I grind for my teammates and the 49ers! I plan on doin this until they won't let me in the building! 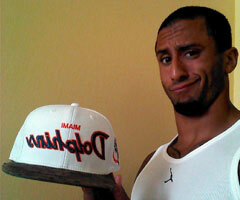 #ridiculous #y'allmustbebored"
The photo of Kaepernick holding the Dolphins hat looks a bit suspect. But if the picture is real, good for him. Bitter fans too often come off like jilted lovers. That might be understandable with a player who failed to live up to his potential, but Kaepernick has given 49ers fans no reason to doubt his fidelity. He began offseason workouts a week after the Super Bowl and even trained with track athletes for two weeks in April. His commitment level is beyond reproach.